PUBLIC EXPENDITURE And Reform Minister Brendan Howlin has said that he is annoyed by a report that his department if at loggerheads with the Health Minister James Reilly over plans for universal health insurance (UHI). A report in today’s Irish Times suggests that the Department of Public Expenditure and Reform has warned that Reilly’s plans for UHI pose a risk to the financial stability of the State and could add as much as €5 billion to the cost of healthcare. Speaking to reporters at the Labour conference in Meath this morning, Howlin said that he has been a “strong supporter” of universal health insurance and said that the correspondence reported in today’s story is “the absolute norm”. “I am surprised to see that early interaction at official level migrating itself into the national newspapers today,” he said. Asked if the health plans pose a risk to the financial stability of the State, Howlin said: “My department has responsibility to look at the costings of every proposal. He said that the correspondence reported today is “official interaction following from official discussions which is absolutely normal in the way that my department deals with every line department” . Speaking this lunchtime, the Social Protection Minister Joan Burton (above) said it is important that any universal health insurance model is “cost-effective” and warned that models similar to the one proposed here have proved expensive in other countries. “I think it has to be at the right price because certainly, when I’ve been in other European countries, and certainly having met people from the Netherlands, some of their pricing has been extremely high,” she said. She also said that “robust discussion” about spending plans is “extremely important”. Email “‘We get on extremely well’: Brendan Howlin ‘annoyed’ by report of rift with James Reilly”. 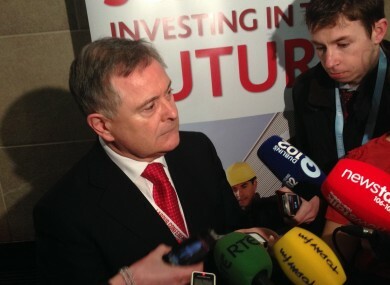 Feedback on “‘We get on extremely well’: Brendan Howlin ‘annoyed’ by report of rift with James Reilly”.